The late gay rights leader is being honored in the air. 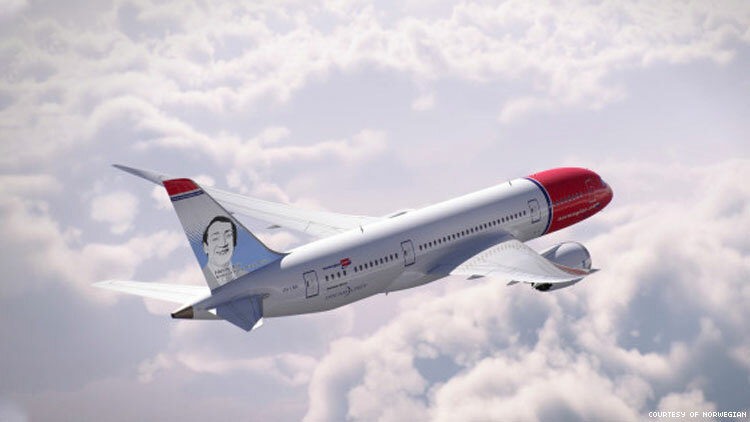 Harvey Milk's legacy is literally soaring thanks to a touching tribute from Norwegian Air. Norway's largest airline named Milk — the late gay San Francisco politician and civil rights leader — one of its "tail fin heroes." The tail fin heroes project is a way of honoring figures from history "who have pushed boundaries" by displaying their portraits on airplane tail fins. Milk's portrait will now appear on a Boeing 787 Dreamliner. Bjørn Kjos, founder and CEO of Norwegian Air, said the company's "vision of diversity" was shared with Milk, one of America's first openly gay politicians, who was assassinated in 1978. His life and death were portrayed in an Oscar-winning documentary and a feature film, Milk, starring Sean Penn as the late icon. "Like ours, Harvey Milk’s mission was reflective of a pioneering spirit," said Kjos. "He demonstrated a tireless hunger to look past the differences of people and instead focus on bringing them together for the greater good. We can’t think of a better way to honor Harvey Milk’s bravery and courage than to dedicate a Boeing 787 Dreamliner to his legacy of equal rights — a tribute that will span the globe for years to come, reinforcing our joint commitment to making the world a smaller, friendlier and more inclusive place." Stuart Milk, Harvey's nephew and cofounder of the Harvey Milk Foundation, praised Norwegian Air for how it honored his late relative. "This is such a unique way to educate and celebrate those that have come before us, allowing for their legacies to live on," Milk said. "We look forward to seeing Harvey 'flying' into airports across the globe and continuing to spread his message of acceptance." Other "tail fin heroes" include Sojourner Truth and Oscar Wilde, a gay Irish writer known for penning The Picture of Dorian Gray.